In 2014, Black Rock City LLC, the organization responsible for production of the Burning Man event in the Black Rock Desert of Nevada, became a subsidiary of the new Burning Man nonprofit. Reflecting that change, we’ve also revised our end-of-year reporting structure. Our AfterBurn reports will continue as they have since 2001, except they’ll now be consolidated, and focus exclusively on the production of the event in Black Rock City. Separately, Burning Man will begin producing an annual report, in addition to the yearly IRS Form 990 financial reporting. 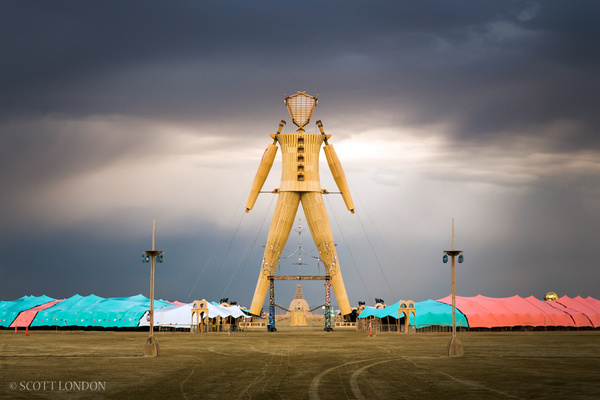 That report will focus on Burning Man’s nonprofit activities and year-round global programming, as well as updates about Burning Man’s organizational infrastructure and support departments (such as Communications, Technology, Legal, Accounting, Human Resources, etc.). 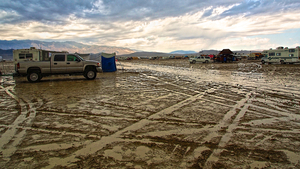 This new AfterBurn report describes the efforts that went into making Black Rock City 2014 possible, including report-outs on event operations, on-playa services, the art of Black Rock City, and the Black Rock City 2014 Census. Burning Man 2014 was marked by superlatives — a massive 105’-tall Man, standing with feet planted firmly on the playa floor; a torrential rainstorm that wreaked minor havoc and shut down Black Rock City for Monday of the event; more art, theme camps and scheduled activities than ever before; and a third consecutive sold-out event, hosting a peak population of 65,922 participants (the widespread reports of Monday’s rainstorm likely responsible for keeping us shy of our population cap of 70,000 participants). 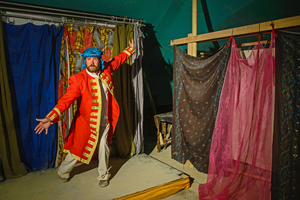 The Caravansary art theme evoked ancient crossroads, where desert-dwelling travelers meet in bustling hubs to share ideas, information and resources. 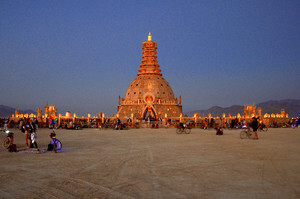 Participants traveled from all points on the playa compass to partake in offerings of the Souk, which encircled the Man. Art groups were invited to set up “shops” in this colorful tented marketplace, offering gifts of invaluable wares, curiosities, performances, and creative interactions. 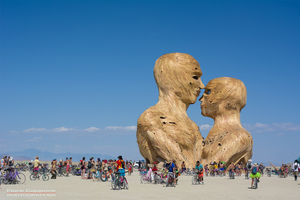 Burning Man awarded more than $800,000 in honorarium art grants to support creation of 61 art installations in 2014, while more than 250 self-funded artworks were built and displayed in Black Rock City by artists from around the world. Dominating the skyline was “Embrace”, a 72’-tall wooden sculpture depicting two people locked in a hug, by Matt Schultz and the Pier Group. It was set alight in an unusual dawn burn on Friday of the event. David Best’s Temple of Grace served as the community’s spiritual touchstone, providing a contemplative space for people to place their personal offerings beneath its soaring dome and elegant chandelier structure. It burned beautifully, and its charred bones sank to the ground with a dramatic twist on Sunday night. To make all this possible, Black Rock City Event Operations coordinated thousands of staff and volunteers throughout the year to execute on the incredibly complex plan to create the essential infrastructure of Black Rock City, including city layout, emergency services, heavy machinery, transportation, sanitation, playa safety services and ticketing — and possibly most importantly, playa restoration at the end of the event. These crews were especially taxed by the rain storm on Monday of the event week, as well as an overwhelming workload at the Box Office, where many participants unfortunately waited upwards of seven hours or more to pick up their tickets at Will Call. With the lessons learned from these experiences, the team will be making appropriate changes to its processes and systems going forward. 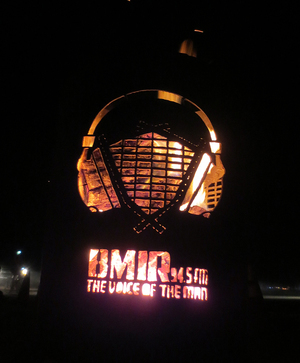 Services and essential civic infrastructure are provided to Burning Man participants by the Community Services, Communications and Public Works crews, including the Black Rock City Airport, Playa Info, Earth Guardians, Burning Man Information Radio (BMIR), Lamplighters, Volunteer Resources, Center Camp Cafe, Camp Arctica ice sales and more. We encourage you to read each of the individual reports in this AfterBurn — taken together they paint a broad-strokes picture of the efforts that go into facilitating the creation of Black Rock City. But Black Rock City is nothing without the incredible creativity, dedication and fortitude of its citizens. Thank YOU, Burners, for everything you do to support and co-create this incredible, ongoing experiment that is spreading around the world and having a lasting, global impact. We’re excited to see how it will play out as this community grows.